If you don't know how to get benchmark datasheets from NGS and convert them into GPX files that go into GSAK, read the paragraph titled How I Hunt Benchmarks in this PDF. Then put this file in the same folder with the program. This isn't a polished program . I wrote it for my use and so far no one else is using it. So, after or when unzipping the download package, put the files in a convenient location and put the GPX file created above in the same folder. This utility adds the GCcom logs to the file, changes the links in each entry from the NGS datasheet to the GC.com benchmark page, and combines the PID & name into GSAK's Code field. It uses the Difficulty/Terrain ratings to indicate a few things about the benchmark such as, was the last log a DNF, is the benchmark in the GC.com database, has anyone logged the benchmark on GC.com, etc. 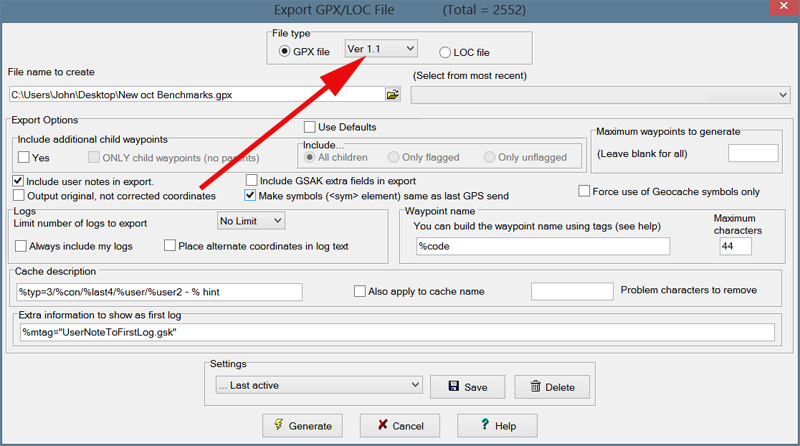 It creates a gpx file with the same name as the input file with an 'R' appended. This new file can then be put back into GSAK ready for use however you use cache data. During processing the program only does one benchmark every five seconds so as not to load the GCcom servers, so it takes a while. For example, it takes about nine minutes to do a hundred benchmarks or an hour and a half to do a thousand.